I won’t say this is the most organized way of storing scraps, but I think it’s kind of fun, and it allows me to combine my love of old containers, particularly old enamelware, with my love of fabric. I’m particularly fond of the enamel lidded pots (lids are good so no one can see how many scraps I have! oh, and they keep out dust… also good). I keep wondering if they ever made these pots in other fun colors – turquoise, or pink, maybe? I have a small pink enamel saucepan, but typically I only see the larger stock pots in white. I’ll keep searching! The old egg basket was a recent gift – thanks again Phiona! – I love the size of it, and even though my scraps try to escape through the sides sometimes, I still think it’s a fabulous spot for storing fabric! I keep them all under my sewing table so they’re out of the way, but still easily accessible when I need to grab some scraps! So tell me, how do you store your scraps? One’s headed to Chris, who gifted me a gorgeous potholder made of Flea Market Fancy hexagons, and one’s going to Cindy, who made me this absolutely fantastic pincushion out of selvages I sent to her (Cindy also sells her selvage pincushions here). Thank you both! Now I just need to get myself some cute pins! Anyone have any favorites? 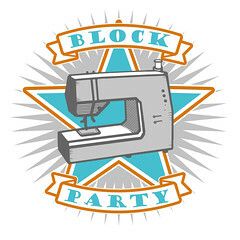 This entry was posted in Fabric, Household Goods and tagged containers, enamelware, fabric scrap storage, fabric scraps, flea market fancy, handmade, pincushion, potholders, vintage. Bookmark the permalink. 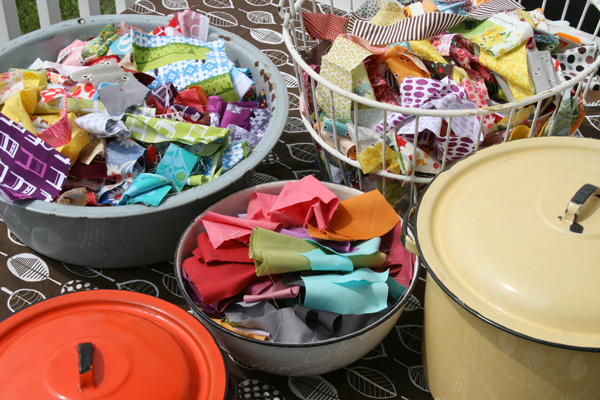 71 Responses to how do you store your fabric scraps? my scraps bins are no where near as creative as yours. I have a huge tinkerbell hamper that holds quite a bit and then another plastic bin under the sewing table that holds the more recent scraps. I could probably go years just using my scraps and never run out. Love the pot holders. Very cute indeed. i keep my scraps in a clear plastic container… it keeps them contained, but lets me see them for inspiration! i just picked up some glow-in-the-dark pins! they’re awfully cute, and since i sew in the kitchen, it makes it easy to find the ones that i’ve dropped at the end of the day! Mine are in plasting rolling carts with drawers. I can see the color in each drawer and the drawers are easy to pull out and sit on my work table. I also cut my scraps into strips and all different size squares and the squares are in different drawer units by size. They come in handy being precut during the few hours I have to sew after work. Love those pothoders and the great selvage loop for hanging! Now I can’t even toss out the selvages? Oh no! I also use an enamel pot to hold supplies. I use baskets, clementine boxes, small suitcases, anything I can find. Dont throw out your selvages! I’d be happy to take them off your hands. I love to use them for projects and am always willing to take selvages from those who don’t want to be bothered with them. I’m neurotic about it. I have them separated out by color, hanging in my Ikea PAX wardrobe. It satisfies my craving to make little colorful bags, and keeps everything where I need it. I use them here and there, but what I really want to do is make an annual or bi-annual quilt of them all. A memoire of the year’s projects. 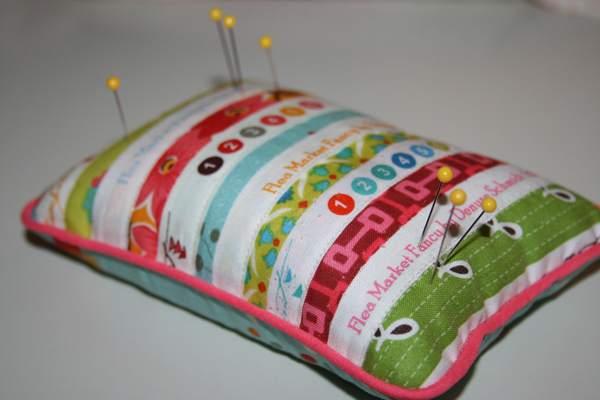 As far as the pins go- I feel like a pretty girl when I use my butterfly quilting pins from Dritz. JoAnn fabrics will have their infamous coupon, or, on occasion, will have quilting notions for 50% off. Otherwise, they’re about $4 per 50.
starjumper… where did you get your hands on glow in the dark pins!? That’s awesome. I have most of my scraps in a giant green plastic bowl that is molded into the shape of a fish (I think it was meant to be a punch bowl) and a couple of small baskets. Your potholders turned out awesome! oh my gosh……I am so excited…yippee! I will check the mail everyday!!! thank you, thank you! my scraps are not living the cool fun life that yours are (LOVE your enamel collection), they are just stuck in a plastic drawer. to organize my stash in a way to store in a closet, I got stackable plastic drawers that now house it all……I like yours much better! I keep my scraps in a large wire basket and a huge spotted plastic bin I got at Target. When I pulled scraps for a quilt as you go quilt along, I ironed them and laid them into a small bin, and I’ve been using those. It’s so nice to have something cut and ironed. I’m trying to figure it if it’s realistic to do that to all of my scraps. Hmmmm. I love hearing about what others do with their scraps! I cut mine into charm squares and I’ve recently started saving any long thin strips for string projects. All of mine tiny scraps are donated to whoever wants them! I dont have a whole lot, so mostly I’ve been keeping my scraps organized by fabric lines and with any larger pieces I still have. Any of the really cute pins I’ve found haven’t worked worth a darn; I’m hoping someone has a great suggestion! Any piece larger than 6″x12″, I store with my fabric stash…which is UNruly! I need to figure that one out! Just like Chris, I am SUPER excited. Hurry, Mr. Mailman, hurry!!! And thank you, thank you!! I have two egg baskets just like yours (only mine are a pale yellow). They had some rusty spots so I just sprayed them with a coating of clear acrylic spray paint and they are great scrap storage containers. I really like your enamel pans. Scrap storage is an ongoing battle/dilemma. Mine are in a 3 drawer plastic container and those drawers are starting to not open due to the scrappy overload! The pot holders are adorable! I store them in a huge plastic bin that I keep under my cutting table, and the overflow super nice scraps are in a large paper bag. Yeah, not so pretty or exciting really but it works. Scraps are taking over my life. I have found some adorably cute pins on etsy from Pincushioncrazy346 – haven’t bought any from them yet, but they are so cute. I don’t think what I do qualifies as “storing”……my scraps just collect in little piles all over the place. Often the “piles” turn into “hills” which soon become “mountains”. Then it is only a matter of time before one gets out of control and tumbles to the floor, at which point one, two, or all three of my dogs think I have just given them a comfy new dog bed to nap in. Wow, I have total scrap envy! Mine all fit in an (extra extra large) ziplock bag! for pins just like the ones she recently featured in a giveaway ! The pots are just too hilarious for storing your scraps. I can just picture the hubby excitedly reaching under your table for a spaghetti pot when he’s run out of clean pans in your absence somewhere ! Keep creating…….I love it ! I love your vintage pot idea! I keep my scraps in a collection of old office-supply containers which I stack in my Ikea Billy Bookshelf. I have doors on my bookshelf, so they’re out of sight, but easy to pull out one at a time for scrap-projects or just color inspiration. I really love having a bunch of different colored scraps to look through sometimes to remind me of all my past projects! I have a stash of strips in a white enamelware and then I also have a galvanized tub that is a left over from a baby shower I did. I do have an enamelware stock pot that is blue that belonged to my grandmother but I have never had any luck in finding any colored ones. I do also have a small pink sauce pan with a removal handle but the handle is missing. Thanks for sharing your storage ideas and your cute potholders. I only have one small container so far. lol It is a zippered Ikea box and serves for now. Why don’t you use some of the scraps, sewn together, and weave the sides of the egg container. It will then be scrappy and able to keep the scraps inside. I hit the jackpot at the dollar store one day and found a bunch of the zippered-top plastic packages like new pillowcases or sheets come in. They were 5/$1 so I bought a bunch of them. I keep my scraps organized by color and then the packages are just the right width for some wire mesh CD holders I found on clearance. They work really well so far! I keep my scraps in a galvanized tub from the local hardware store. It rests under my cutting table. Michael’s has some pins in their scrapbook and jewelry section that has great little flower and bird tops. Mine are in set of 5 big plastic rolling drawers so I can see which colour is in which and move the drawer set around as needed! Works well… when the drawers get too full I know it’s time to make something scrappy! Good for rummaging in when doing applique and if I ever need to transport them I just take the drawers out and stack them on top of each other so they compact down nicely! I don’t have a lot of space to store scraps, so I throw them all into one rubbermaid bin. One day, I hope to randomly pull from that bin to make a quilt! This is a lot more organized than my scraps:) My scrap box is a source of frustration. Inspiration will strike, and I will scour through my overfilled, plastic bins in search of that one piece of fabric that I just know I have a piece of somewhere. 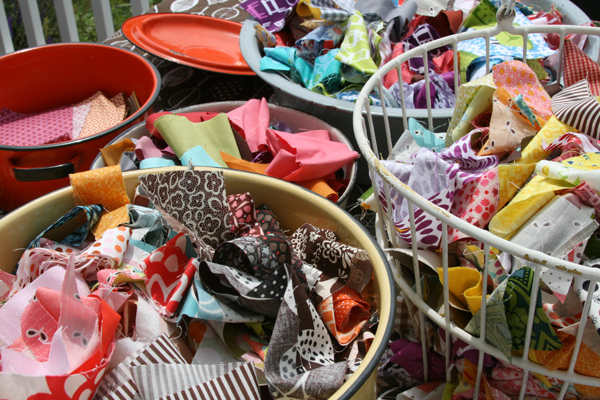 I have dreams of fabric scraps neatly folded and arranged and categorized in their own organized craft closet. Your scrap bin make me smile! Pot holders are beautiful i just love the colors. I use a lot of my scraps for little projects, so I don’t have that many. Those that I do have I separate scrap strips from other odd shapes and they live in plastic bags shoved in the back of a cupboard! I don’t have any spare storage in my place, so it’s not very organised. I swear by the long flat-headed dressmaking pins (also called flower heads) they are so much better to use that round headed or no-headed pins. I like those potholders. I have just made a bunch that aren’t nearly as pretty as yours! I have a clear plastic container with a lid, so I can see them, but they don’t get dusty! I love you storage though, and have been looking for something more creative and fun! The idea of a selvage as a hanging tag is great! As for my scraps, I keep them in paper boxes. Anytime I find a cute paper box I fill it with scraps. I won’t say that the last time I bought underwear it was because of the paper box it came in but… sort of! How obsessed I am with fabric??? I adore enamelware too! 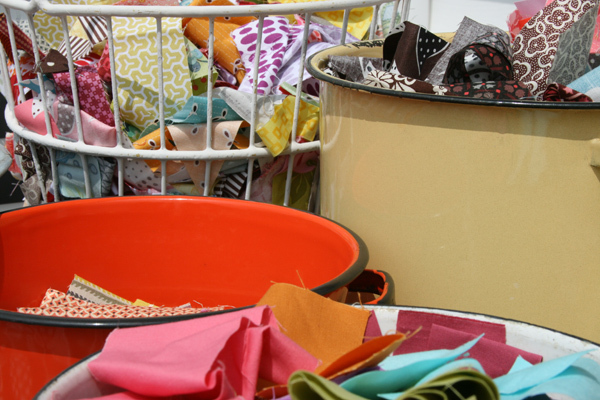 I use them for lots of things – planters, my dog’s water bowl, but I never thought of storing fabrics! I use lined baskets for mine. I bought shoebox-sized plastic tote with locking lids at Walmart. They are clear and each holds a color. I love looking at the stack of boxes like a rainbow of fabric! Currently using large sized clear ziplock bags according to color and then just putting them in my cupboard. It’s not bad as I’m able to see through the clear bag at all my scrap possibilities. I’m working on developing a scrap collection… Right now I just have a record bowl made from an LP I picked up at half-price books storing my tiny collection. Do you sort yours beyond prints and solids? I know some people sort them into different containers for warm and cool colors. i am SO ridiculously jealous of your scraps!!! 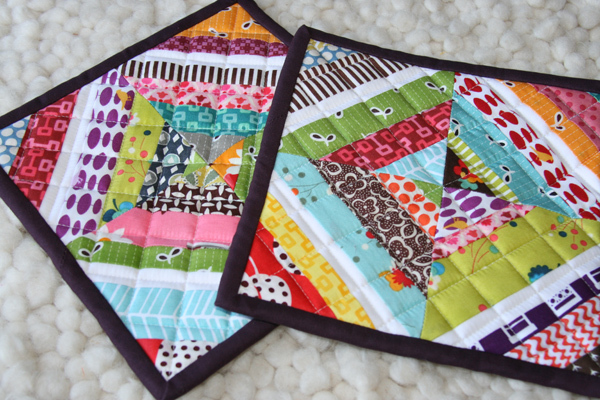 i want to make more quilts purely to HAVE scraps!! i show mine of in a (yes, singular, ONE…) round glass bowl above my sewing desk. 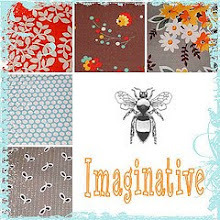 i think it looks really cute and reminds me of some of my favourite fabrics, that have come and gone…. Love the potholders, and the selvedge for hanging is too cute!! you could ask at your quilt store to save scraps for you from the people who take classes. also Wallmart, mary Maxim, Hobby Lobby etc they would have scraps. Put an add in the paper or internet wanted scraps. When i go to retreats i take everyones scraps that they don’t want. If you spread the word that you are looking for scraps you will be amazed at how many people will gladly give you theirs. Happy Hunting! I love the beautiful jumble of scraps and strips in the variety of containers. I usually throw my strips into a basket, that has become two baskets, and I desperately need a third. I like the idea of containers with lids, because the cats think that baskets of scraps are the purrfect size for them and the cat’s meow to take a nap in (sorry about that — I couldn’t resist). I think my problem with other scraps is that I over think it. I have been trying to separate tiny scraps (perhaps suitable for tickertape type quilts or such) from slighter larger pieces (that might be good for hexies or applique), to larger pieces, etc. And it keeps getting more complicated. I need to remind myself to keep it simple, and use containers that make them a joy to look at while they wait on their chance to shine in a future quilt or project. I use clear plastic tubs and then within that I sometimes will put the same color scraps into ziploc bags so when I need a certain color, I just go the bag. Hey! I also love enamelware and have a pot for you. Our public television studio (CBC) decided to get out of the props business a few years ago and had fantastic sale. I picked up a huge enamelware roasting pan (baby blue and white) with lid that I love but have not had a use for. I would love to send it to you. Can you tell me where I should send it if you’d like it? Just yesterday I saw a small, oval, turquoise, enamelware roaster, maybe for a chicken? It was too cute, I just didn’t know what I’d use it for. Hmmm……. Maybe I need to go take another look at it! & the first post i read is a subject very close to my heart! no need to hide them in a *scrap drawer* as they are all soo lovley in a big pile together…. am going back to trawl through your gorgeous blog, with a cup of tea before the kids break up for the summer…. I had been saving the cute little green cardboard baskets from the blackberry farm we went to a couple years back – I knew they’d come in handy some day – and this weekend, they finally did! I sorted my smallest scraps by color and put them in their own berry basket! They are small and cute and I’m so glad I never threw them away! The last time I moved I got very organized and sorted them by color into plastic boxes. Now that I’ve got my sewing area all organized to my liking, the plastic boxes are tucked away under the eaves which means I now pile them up on my sewing table or chuck them into one of those lovely Whole Foods bags. I love love love the way you store your scraps, so unique. Right now all of mine reside in clear plastic containers. For a while I tried to neatly fold and control mine. I’m learning scraps have a mind of their own and are best left messy. Besides, creativity is probably better that way! Potholders and adorable, I need to make me some of them! I make a lot of quilts using mostly 2 1/2″ strips. I cut material or leftovers into strips and put them in snack baggies. It works great and then put them in plastic drawers. Usually devote on drawer for each color and one drawer for the multiple colors. Then I have 1 yard cuts in large plastic bags on shelf. Fat quarters and 10″ squares go in sandwich bags and go in tubs that are the same height so they can stand up. Smaller scraps go in sandwich bags. Haven’t found anything else to do with the little (?) bits. I have a hard time even throwing away my thread snips, I make a lot of ATC’s, Postcards, pin cushions, art quilts. I store a number of my scraps in those very large clear plastic pretzel barrels, also the large clear flower vases. Looks pretty and i can seem them. I also use the lager tomato totes. Have enjoyed reading on how folks store their stash. I secretly think they party at night, multiple and sometimes I end up with some of that “that were you thinking” fabric. I used to store my scraps in clear plastic containers that take up room that I really don’t have. Now I use a clear plastic over-the-door shoe holder that works great and looks even better with all the organized, colorful scraps filling the pockets. 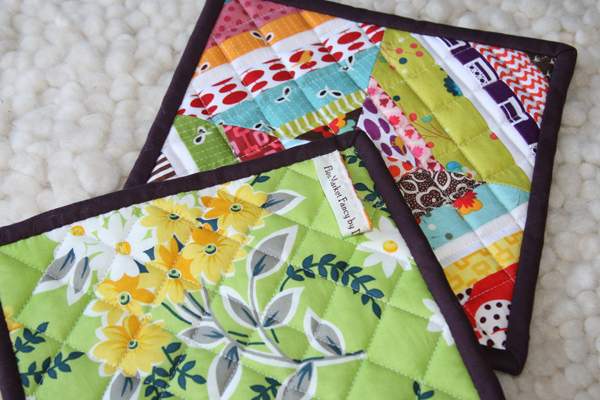 I love your potholder: simple, cute, ‘green’ and quilt-as-you-go (who could ask for more?). Oh my gosh, I love your shoe holder idea, but I’m going to use it for ribbon scraps. Somehow I have accumulated a zillion of them. Perfect! Fun to read all these ideas, and imagine all the scraps getting together to party. You are all life-savers. My boyfriend and I are moving into a house where I get MY OWN SEWING ROOM!!! (slash my office / guest room) under the condition that my sewing stuff doesn’t grow and take over as it has done in our current apartment. I think before we pack up and move I will organize large pieces of fabric (guilty: I buy fabric then get too busy and never get to the project…) in giant Ziploc bags, then store them (by color) in clear bins that will fit in the guest room closet. For smaller scraps I LOVE the idea of the clear plastic over-the-door shoe organizers – genius!! Any other clever hints for setting up my brand new space?? i too store scraps, and cut fabric in enamelware bowls and pots, oh, and even an enamelware colander. also, YES enamelware came in other colors. and i know this because i have a 16″ diameter hunter green bowl. and it’s not painted! I store scraps in a Silver (tarnished)Punch Bowl that my mother-in-law gave me YEARS ago. I figured it’s better being used as a fabric/scrap bin than tarnishing in the attic feeling abandoned! I keep mine in my super-cool IKEA “MUCK” bins. I love your electic mix of containers too! One thing I like about the IKEA bins, is that I can stack them with the scraps in, when I need to put things away. I live in a really small space and my “quilting center” is also my dining room! Unfortunately I just checked and they don’t carry the MUCK bins anymore. But any kind of graduated stacking bins would work if you live in a small space and need to clear your crafty space now and again. Thanks for your great ideas. I mostly make historical costumes and larger projects so I end up with a TON of scraps. I have an 18″ by 12″ by 3′ blue antique foot locker I keep all my scraps in. I have it standing up on end next to my desk and it looks great… and no one knows what’s in it! I have a small kids’ clothing company, so I get a LOT of scraps! Some I donate to my kids’ schools or to other kids who want to learn to sew. But the rest, well, they were shoved in garbage bags around my office area until my mom came to visit. She ironed and folded every single one and now they’re stacked in clear plastic bins with labels, arranged by color. We’ll see how long that lasts! Pingback: DIY Fabric Home Decor: Fom Boring to "Fab"
I struggled before with scraps and now that I got rid of the shoe holder rack and use bins so much better. here’s my post about it scrap organization in my sewing room.